Angry about the state of the “library” at Georgian college? Do you find it ridiculous that as university students you have virtually zero reference materials and unacceptable library hours (especially on the weekends)? Well, the LSU is on it. There is a petition circling in hopes of extending the library hours to more appropriate times in order to better serve the university students on this campus. We deserve an adequate space to study and research. Join the fight today by signing the petition below and returning it to our office (E112 A) or stopping by our office (E112 A) and signing it! Petition Summary: The Georgian College Library hours of operation do not meet the current demands of Georgian College and Laurentian University students. As a facility catering to college, university and post-graduate students, we, the students, are not provided with the services we require to complete our studies. EXTEND LIBRARY HOURS!!! Let’s make the Georgian College Barrie Campus a place where after class/independent learning is fostered!!! Help Georgian/Laurentian students embrace their entrepreneurial ambitions by providing the resources they need! Other universities and colleges in Ontario offer weekly hours to at least 12:00am and up until 2:00am during exam time, as well as certain areas open 24/7! Let’s lose the title of a “commuter” college/university! Help PROVIDE us with the resources! We will use them! Please sign this petition to increase library hours and study resources at Georgian College Barrie Campus!!! The health plan is now active! Students can now use their plan numbers directly- the prefix LSB followed by their Georgian student number followed by two zeroes. For additional information please see the health and dental plan section on the website! If you encounter any issues or have questions regarding your plan that cannot be answered on the website call the GreehShield help line at 1.888.711.1119. 12pm in room K229 B (Alumni Hall) and there will be pizza and refreshments for all students attending. 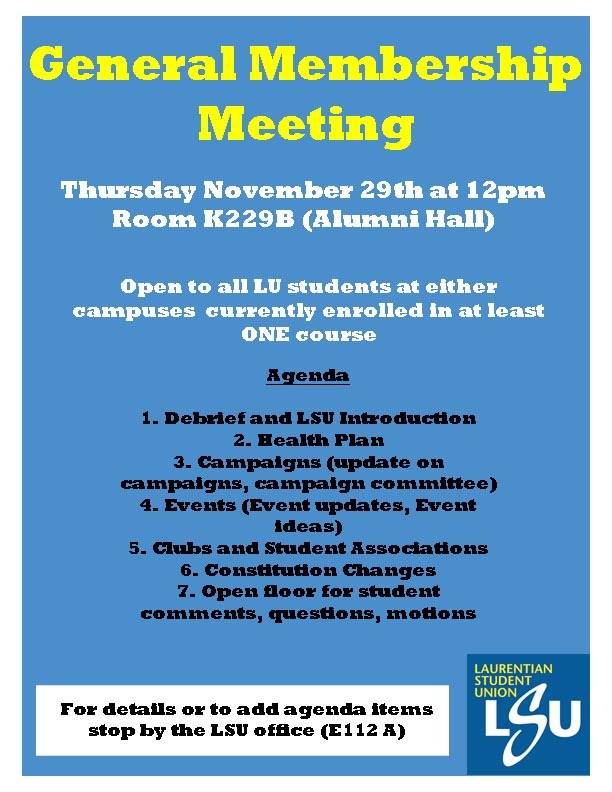 The General Membership Meeting (GMM) is a forum of direct democracy open to all Laurentian student’s studying at either the Barrie or Orillia campuses. Student’s may participate if they are currently enrolled in at least ONE Laurentian University course. The GMM facilitates a ‘bottom-up’ democratic process, ensuring that your students’ union, the Laurentian Students’ Union (LSU) has a mandate that is established by and for the student’s it represents. The LSU believes that empowered GMMs are the most effective way to ensure that all voices are provided a forum to influence the decision making process. In other words, the direct democracy of the GMM allows those who are most affected by decisions the opportunity to participate in the process of making those decisions. So, the LSU invites you to come out and make your voice heard. Come to the GMM to listen, discuss, debate, and vote on issues that directly affect your experience as a University student. This is a preliminary agenda, and may be edited as the GMM comes closer. Students may wish to add items to the agenda, and if they do, please contact Mark Gauci (vpactivities@thelsu.ca) or post on this event. Additional items can be added to the agenda after being presented at the beginning of the GMM and must be endorsed by no less than a 2/3rds majority. Ratification of all motions presented to the GMM must be endorsed by no less than a 2/3rds majority. Thursday November 29th, 2012 at 12pm in room K229 B (Alumni Hall) and there will be pizza and refreshments for all students attending. The Laurentian University Annual Model Parliament trip is a four-day, three-night trip in which students from both the Sudbury and Barrie campuses travel to Ottawa and take part in a unique simulation of Canadian government. The 2012 Model Parliament trip takes place January 10th -13th. Students will travel to Ottawa on Thursday, leaving in the early morning and arriving in time to settle into the hotel and prepare for the following day. Students will attend a guided tour of Parliament on Thursday evening, as well as attend a caucus meeting in order to meet members of their party. On the Friday, the group will sit in the House of Commons and participate in a mock model of Parliament where students debate and negotiate on bills in proceedings that mimic current Parliament. It is a fantastic educational experience that all Laurentian students should consider attending. The House sits from 9-5, with a break for lunch in between. After the House adjourns, students will have the chance to walk through Parliament to East Block and dine at a catered banquet in the same room that the Government holds receptions and parties in. At the banquet, students receive awards for outstanding performance – Best Speech, Best MP, Best Statement. From Friday night until Sunday morning students are on their own to explore Ottawa and Quebec. The trip will cost $170 per person and cheques can be made out to Laurentian Student Union. Payments from students are due Thursday, November 10 along with an application, available in the LSU office, E112A. Payments must be delivered to the LSU office. Cash and cheques are acceptable and no refunds are given. There are 55 spots available on the trip and will be awarded on a first come, first serve basis. The Laurentian University Annual Model Parliament Trip has always been one of the best memories for Laurentian graduates, because this trip is not only a great educational experience, but a chance to get to know your peers and professors. The trip is open to all Laurentian students. The annual Model Parliament trip is a Laurentian tradition that has lasted over 17 years. Laurentian University is only one of two universities in the country that has the privilege to sit in the House of Commons. 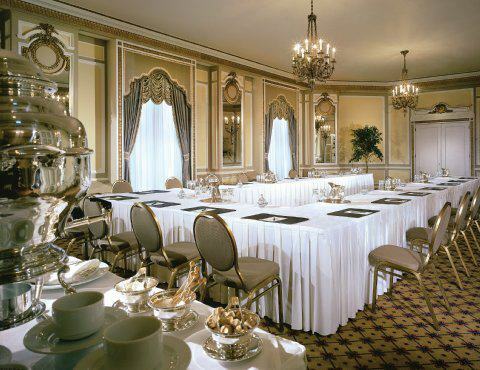 Students will also have the privilege of dining at the Chateau Laurier, a beautiful venue. To sign up for the trip, or if you have any questions or concerns please drop by the LSU office, room E 112 a. You can also fill out the form below and return it to the LSU office before November 30th 2012!